Written by Travel Excellence After an unforgettable performance, Craig "Tequila" Schieber wrote his name on Costa Rica history as the first world champion at the last ISA World Masters Surfing Championship held in El Salvador. The “tico” entered the history books of world surfing as the best surfer in the Grand Kahuna category (over 50 years). Schieber, naturalized Costa Rica 20 years ago, lives in Puerto Viejo, one of the favorite destinies for Costa Rica tourism. According to experts, the new champion is a good sample of discipline and courage. To win, “Tequila” had to beat some great surfers from U.S. and South Africa, among others. After qualifying to the final in a World Championship of International Surfing Association (ISA), Schieber gave to the country the first Olympic medal in Surfing, a discipline which has thousands of fans. In fact, Surfing is one of the favorite things to do in Costa Rica for visitors and local tourists, due to Costa Rica weather and its beautiful beaches on both coasts. That is one of the main reasons for the new Costa Rican champion to live in Puerto viejo. Back to the tournament, “Tequila” managed to advance three playoff series in the two categories that he was participating before his final victory. The first one was in Kahuna (45 to 50 years) where he combined 12.00 points. In his second playoff, in the Grand Kahuna (over 50), Schieber beat some important competitors from El Salvador, Trinidad and Tobago and Mexico. Noteworthy to mention that people from El Salvador acclaimed the only Central American surfer present in the final of the first world championship held in this country. 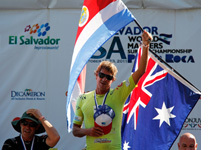 With loud applause, they recognized the great work of Schieber, who walked up the Costa Rica flag in Punta Roca. On the other hand, fellow Costa Rican Andrea Diaz did her best performance and ranked fifth in the same tournament. The first place in this category was for the seven times ASP world Australian champion, Layne Beachley, who collected her first gold medal in the World ISA.